4274. Eugene Frederick "Gene" BERNHEISEL 1, 2 (Otto Collins BERNHEISEL , John William BERNHEISEL , Abigail MAURER , Sarah BITLER , John , Johannes ) was born on 5 Aug 1923 in Englewood, Montgomery Co, OH. He died on 23 Jul 2006 in Thorton, Limestone Co, TX. He was buried on 27 Jul 2006 in St. Bernard Memorial Gardens, Chalmette, LA. Gene resided in 1930 in Main St, Englewood, Randolph Twp, Montgomery Co, OH. He graduated from Randolph High School in Englewood, Montgomery Co, OH. He was issued a social security number before 1951 in OH. He served in the military with U.S. Navy - LST 1029 from 1943 to 1946 in South Pacific. He worked with American Standard Company (30 yrs). He resided in May 2005 in Chalmette, LA. He was a member of St. Mark Church in Chalmette, LA. He was a member of Our Lady of Prompt Succor Church in Chalmette, LA. He was a member of St. Mary's Catholic Church in Mexia, TX. Gene also married Betty BERTHELOT. 8550 F i Nancy BERNHEISEL. 8551 M ii Michael F BERNHEISEL. 8552 M iii Roy BERNHEISEL. 4278. Wilson A BERNHEISEL 1 (George W BERNHEISEL , Henry BERNHEISEL , Abigail MAURER , Sarah BITLER , John , Johannes ) was born on 11 Aug 1913 in OH. He died on 4 Apr 1971 in Good Samaritan Hospital & Health Center, Dayton, Montgomery Co, OH. Wilson resided in 1920 in Carlisle Pike, German Twp, Montgomery Co, OH. He resided in 1930 in Jackson Twp, Montgomery Co, OH. He worked as Farm Laborer - Farm in 1930. He was issued a social security number before 1951 in OH. He resided in 1957 in Dayton, Montgomery Co, OH. He resided in Apr 1971 in Dayton, Montgomery Co, OH 45414. 8553 F i Beverly BERNHEISEL. 8554 M ii Gary A BERNHEISEL. 4279. Russel H KESLING 1 (Martha C BERNHEISEL , Henry BERNHEISEL , Abigail MAURER , Sarah BITLER , John , Johannes ) was born on 16 Jul 1909 in IN. He died on 2 Feb 1998 in Miamisburg, Montgomery Co, OH. Russel resided in 1920 in 2024 Spear St, Logansport, Cass Co, IN. He resided in 1930 in Franklin Twp, Warren Co, OH. He worked as Electrician - Steel Mill in 1930. He was issued a social security number in OH. He resided in 103 Candlewood Ct, Germantown, Montgomery Co, OH. Russel married Nola M BAKER 1, daughter of Thomas BAKER and Sara Elizabeth ROGERS. Nola was born on 20 Dec 1910. She died on 27 Dec 2003 in Harborside Health Care Center, New Lebanon, Montgomery Co, OH. She was buried on 31 Dec 2003 in Germantown Cemetery, Germantown, Montgomery Co, OH. Nola resided in 103 Candlewood Ct, Germantown, Montgomery Co, OH. She was issued a social security number in 1963 in OH. She resided in Dec 2003 in Germantown, Montgomery Co, OH. + 8555 M i Floyd KESLING. 8556 M ii Glenn Nelson KESLING. Glenn married Joyce E OAKS. 8557 M iii Clyde KESLING. + 8558 M iv Wayne E KESLING. + 8559 F v Carol Ann KESLING. + 8560 M vi Frank KESLING. 4281. Lawrence A KESLING 1 (Martha C BERNHEISEL , Henry BERNHEISEL , Abigail MAURER , Sarah BITLER , John , Johannes ) was born on 8 Dec 1915 in IN. He died on 27 Apr 1996 in Kettering Medical Center, Kettering, Montgomery Co, OH. Lawrence served in the military with U.S. Navy. He worked as Electrician/Construction. He resided in 1920 in 2024 Spear St, Logansport, Cass Co, IN. He resided in 1930 in County Line Rd, Jackson Twp, Montgomery Co, OH. He was issued a social security number before 1951 in OH. He resided in Apr 1996 in Farmersville, Jackson Twp, Montgomery Co, OH. Lawrence married Ariel A 1. Ariel was born on 9 Jan 1911. She died on 18 Oct 2004 in Harborside Nursing Home, New Lebanon, Montgomery Co, OH. She was buried on 21 Oct 2004 in Preble Memory Gardens, West Alexandria, Preble Co, OH. Ariel was a member of Farmersville United Methodist Church. She was issued a social security number before 1951 in OH. She resided in Oct 2004 in Farmersville, Jackson Twp, Montgomery Co, OH. Connie KESLING 1 died before Oct 2004. 8562 F ii Donna KESLING. 8563 F iii Betty KESLING. 4284. John Sylvester SPITLER [scrapbook] 1, 2, 3, 4 (William Alonzo SPITLER , Sarah Margaret BERNHEISEL , Abigail MAURER , Sarah BITLER , John , Johannes ) was born on 24 Jan 1891 in Lanier Twp, Preble Co, OH. He died on 15 Jan 1976 in At Home, Preble Co, OH. He was buried on 18 Jan 1976 in Sugar Grove Cemetery, Lanier Twp, Preble Co, OH. John resided in 1900 in Jackson Twp, Montgomery Co, OH. He resided in 1910 in Lanier Twp, Preble Co, OH. He resided in Dec 1915 in Lanier Twp, Preble Co, OH. He worked as Farming in Dec 1915. He resided in 1930 in Ingomar & Enterprise Rd, Lanier Twp, Preble Co, OH. He worked as Farm Laborer in 1930. He resided in Mar 1939 in West Alexandria, Preble Co, OH. He resided in 1958 in West Alexandria, Preble Co, OH. He resided in Jan 1976 in 22 W Second St, West Alexandria, Preble Co, OH. 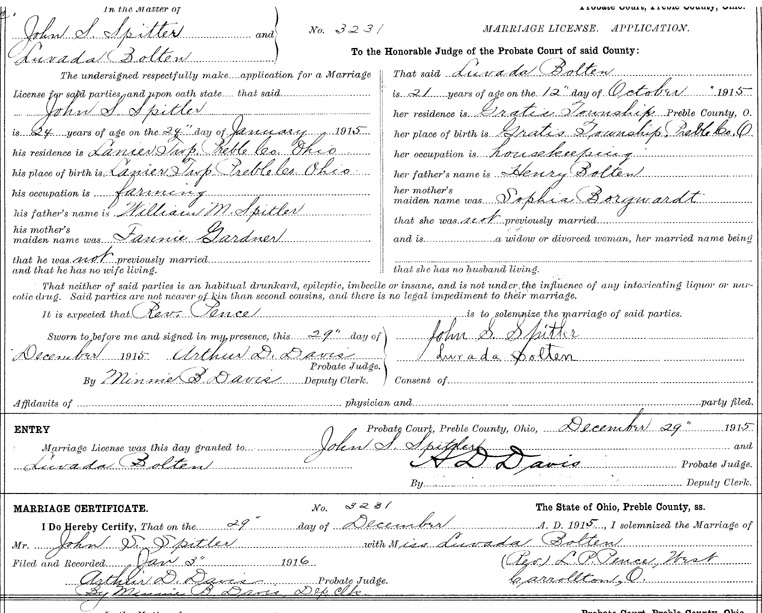 John married 1 Luvada E BOLTEN [scrapbook] 2, 3, 4, daughter of Henry BOLTEN and Sophia BORGWARDT, on 29 Dec 1915 in Preble Co, OH. Luvada was born on 12 Oct 1894 in Gratis Twp, Preble Co, OH. She died on 8/10 Dec 1979 in At Home, West Alexandria, Preble Co, OH. She was buried on 13 Dec 1979 in Sugar Grove Cemetery, Lanier Twp, Preble Co, OH. Luvada was issued a social security number before 151 in OH. She resided in 1900 in Gratis Twp, Preble Co, OH. She resided in 1910 in Gratis Twp, Preble Co, OH. She worked as Housekeeping in Dec 1915. She resided in 1930 in Ingomar & Enterprise Rd, Lanier Twp, Preble Co, OH. + 8564 M i Floyd Lee SPITLER Sr was born on 15 Jan 1918. He died on 29 Jan 2002. 4285. Mary Etta ""Maime"" SPITLER [scrapbook] 1, 2, 3, 4, 5, 6, 7 (William Alonzo SPITLER , Sarah Margaret BERNHEISEL , Abigail MAURER , Sarah BITLER , John , Johannes ) was born on 24 Jul 1892 in Butler Co, OH. She died on 22 Feb 1989 in At Home, W Dayton St, West Alexandria, Preble Co, OH. She was buried in Twin Valley Cemetery, West Alexandria, Preble Co, OH. "Maime" resided in 1900 in Jackson Twp, Montgomery Co, OH. She resided in 1910 in Lanier Twp, Preble Co, OH. She resided in Dec 1911 in Lanier Twp, Preble Co, OH. She worked as Housekeeping in Dec 1911. She resided in 1920 in Enterprise Pike, Lanier Twp, Preble Co, OH. "Maime" married Roy C EUBANK [scrapbook] 1, 2, 3, 4, 5, 6, 7, son of Christ EUBANK and Rosetta SCHLUSSER ""Rosa"", on 25 Dec 1911 in Preble Co, OH. Roy was born on 8 Sep 1892 in Montgomery Co, OH. He died on 13 Jun 1967 in Oak Lawn Rest Home, Eaton, Preble Co, OH. He was buried in Twin Valley Cemetery, West Alexandria, Preble Co, OH. Roy worked as Highway Department Worker. He was a member of St John's Lutheran Church - Member in Ingomar, Preble Co, OH. He resided in Dec 1911 in Twin Twp, Preble Co, OH. He worked as Farming in Dec 1911. He resided in 1920 in Enterprise Pike, Lanier Twp, Preble Co, OH. He worked as Farmer in 1920. 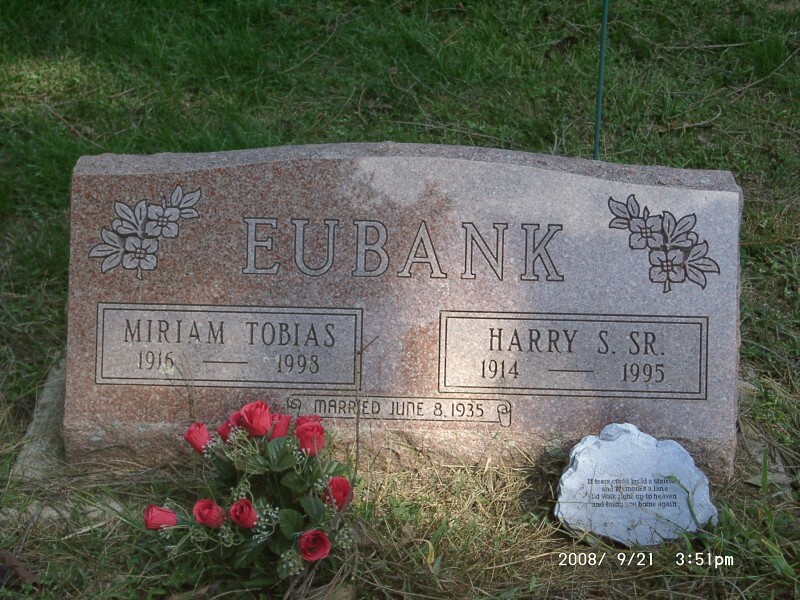 + 8565 F i Irene Louise EUBANK was born on 4 Dec 1912. She died on 4 Feb 2000. 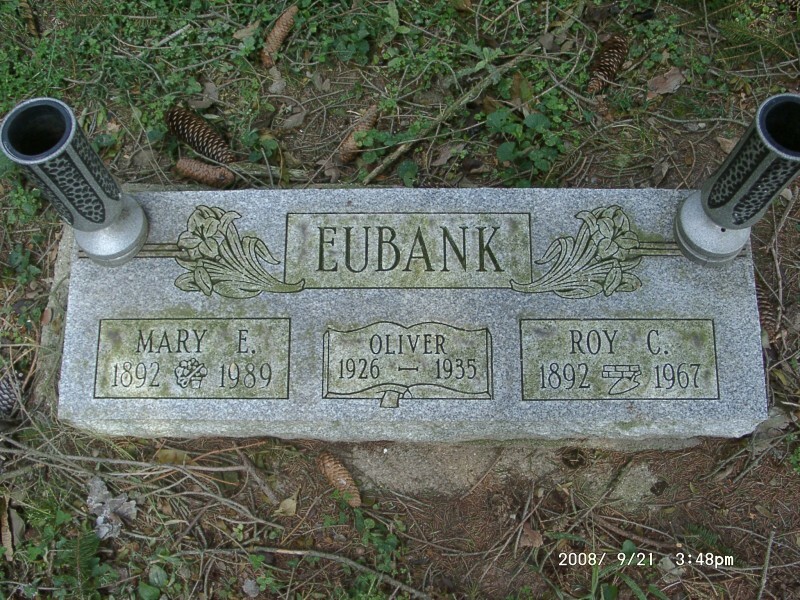 Harry S EUBANK Sr. [scrapbook] 1, 2, 3, 4, 5 was born on 19 Nov 1914 in Hocking Co, OH. He died on 3 Aug 1995 in Good Samaritan Hospital & Health Center, Dayton, Montgomery Co, OH. Harry resided in 1920 in Enterprise Pike, Lanier Twp, Preble Co, OH. He was issued a social security number before 1951 in OH. He resided in Feb 1989 in New Lebanon, OH. He worked as Carpenter. He resided in 12090 Old Dayton Rd, New Lebanon, Montgomery Co, OH 45345. Harry married Miriam TOBIAS [scrapbook] on 8 Jun 1935. Miriam was born on 26 Dec 1916 in Montgomery Co, OH. She died on 24 Jul 1998 in Montgomery Co, OH. She was buried in Twin Valley Cemetery, West Alexandria, Preble Co, OH. + 8567 M iii Leonard J EUBANK Sr was born on 13 Apr 1918. He died on 23 Jul 2001. + 8568 M iv Clifford W EUBANK was born on 12 Sep 1923. He died on 17 Dec 2006. + 8569 F v Violet J EUBANK was born on 6 Dec 1929. She died on 18 Jan 1998. 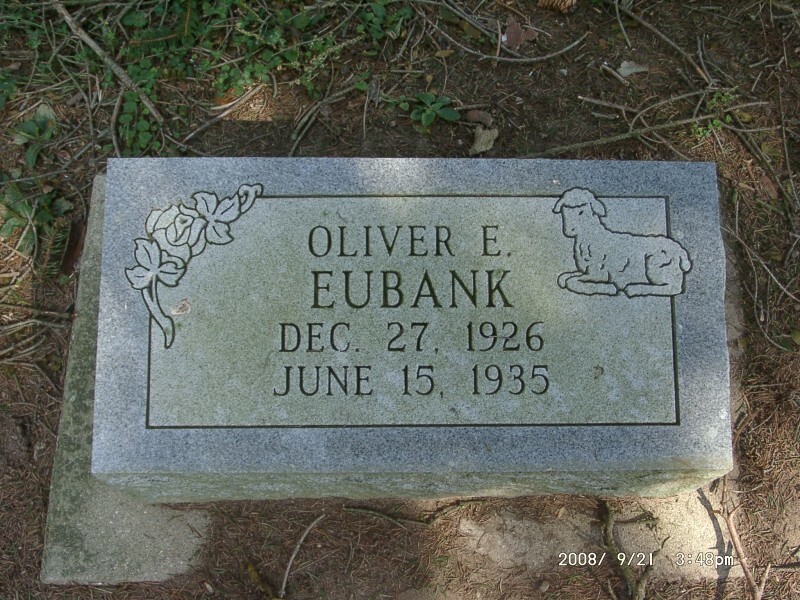 Oliver E EUBANK [scrapbook] 1 was born on 27 Dec 1926 in OH. He died on 15 Jun 1935 in Dayton, Montgomery Co, OH. He was buried in Twin Valley Cemetery, West Alexandria, Preble Co, OH. 4286. 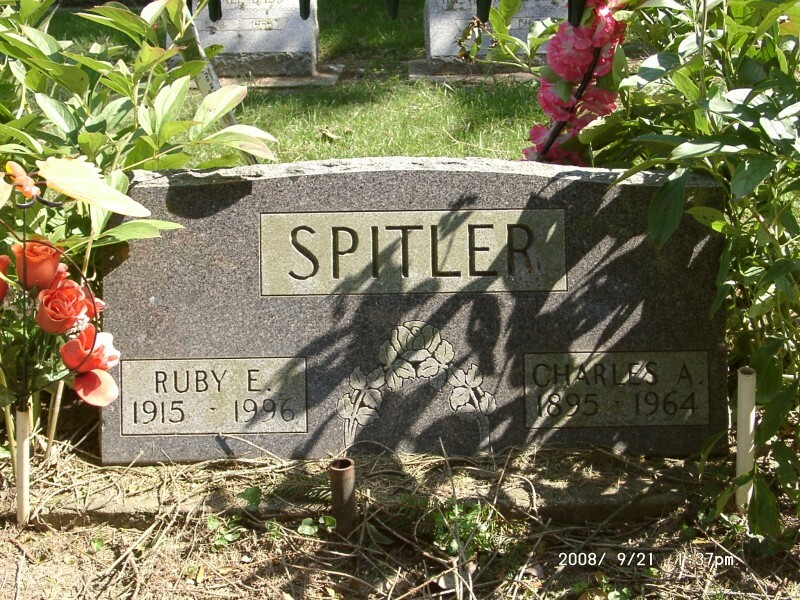 Charles Arthur SPITLER [scrapbook] 1 (William Alonzo SPITLER , Sarah Margaret BERNHEISEL , Abigail MAURER , Sarah BITLER , John , Johannes ) was born on 16 May 1895 in Preble Co, OH. He died on 19 Dec 1964 in Dayton, Montgomery Co, OH. He was buried in Twin Valley Cemetery, West Alexandria, Preble Co, OH. Charles resided in 1900 in Jackson Twp, Montgomery Co, OH. He resided in 1910 in Lanier Twp, Preble Co, OH. He resided in 1958 in West Alexandria, Preble Co, OH. Charles married Ruby E WING [scrapbook], daughter of William Herbert WING and Sylvia Jane KOONTZ. Ruby was born in 1915. She died in 1996. She was buried in Twin Valley Cemetery, West Alexandria, Preble Co, OH. 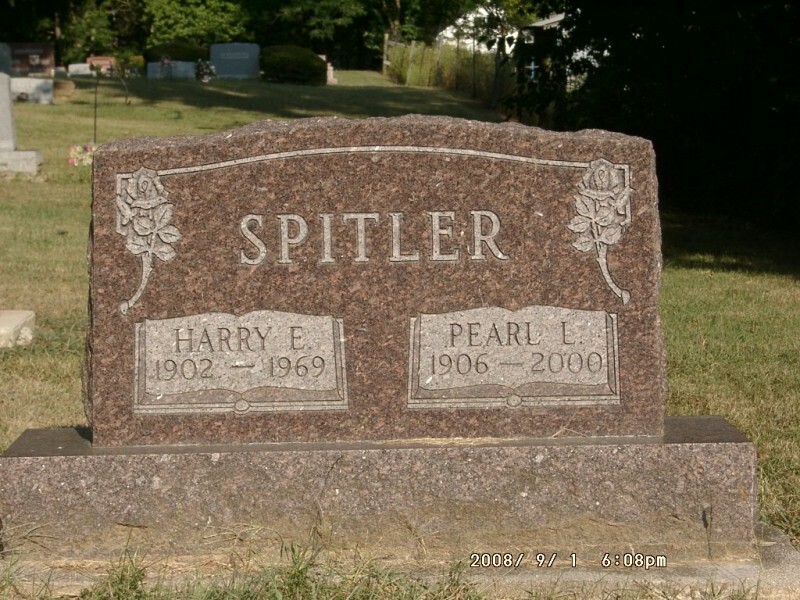 + 8571 M i Harold Eugene SPITLER was born on 24 Jul 1917. He died on 12 Jan 1975. 4287. Delmont Medford "Mike" SPITLER [scrapbook] 1, 2, 3, 4, 5, 6 (William Alonzo SPITLER , Sarah Margaret BERNHEISEL , Abigail MAURER , Sarah BITLER , John , Johannes ) was born on 3 Jan 1898 in Preble Co, OH. He died on 3 Sep 1990 in West Alexandria, Preble Co, OH. He was buried in Twin Valley Cemetery, West Alexandria, Preble Co, OH. Mike resided in 1900 in Jackson Twp, Montgomery Co, OH. He resided in 1910 in Lanier Twp, Preble Co, OH. 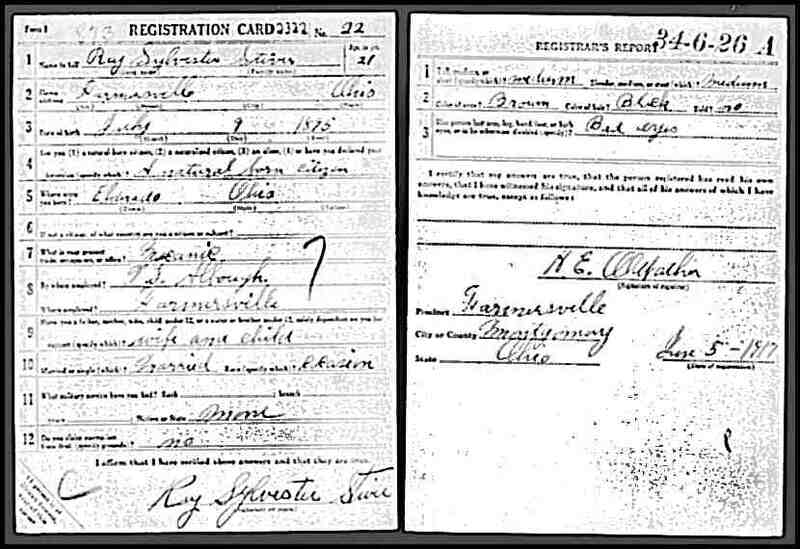 He resided in Sep 1915 in RR4 West Alexandria, Preble Co, OH. He worked as Farm Laborer in Sep 1915. He resided in 1920 in Lanier Twp, Preble Co, OH. He worked as Farmer - Tobacco Cropper in 1920. He resided in 1930 in Ingomar & Enterprise Rd, Lanier Twp, Preble Co, OH. He worked as Farm Laborer in 1930. He was issued a social security number before 1951 in OH. He resided in 1958 in West Alexandria, Preble Co, OH. He resided in Enterprise Rd, West Alexandria, Preble Co, OH. Mike married Grace M BORGWARDT [scrapbook] 1, 2. Grace was born on 30 Jun 1902 in OH. She died on 26 Jan 1975 in Eaton Care Center, Eaton, Preble Co, OH. She was buried in Twin Valley Cemetery, West Alexandria, Preble Co, OH. Grace resided in 1930 in Ingomar & Enterprise Rd, Lanier Twp, Preble Co, OH. She was issued a social security number before 1951 in OH. 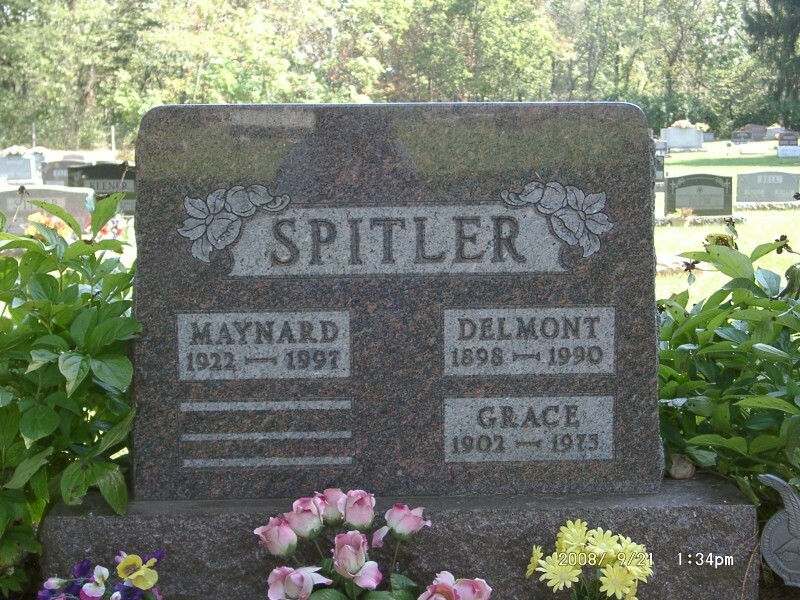 Maynard J "Mike" SPITLER [scrapbook] 1, 2, 3 was born on 25 Sep 1922 in OH. He died on 7 Jul 1997 in At Home, Preble Co, OH. Mike resided in 1930 in Ingomar & Enterprise Rd, Lanier Twp, Preble Co, OH. He served in the military with U.S. Army on 28 Nov 1942. He worked as Carpenter. He was issued a social security number before 1951 in OH. He resided in Sep 1990 in West Alexandria, Preble Co, OH. He resided in 3146 Enterprise Rd, West Alexandria, Preble Co, OH. 4291. Harry Ellsworth SPITLER [scrapbook] 1, 2 (Daniel Franklin SPITLER , Sarah Margaret BERNHEISEL , Abigail MAURER , Sarah BITLER , John , Johannes ) was born on 22 Nov 1902 in OH. He died on 19 Jan 1969 in Grandview Hospital, Dayton, Montgomery Co, OH. He was buried in Twin Valley Cemetery, West Alexandria, Preble Co, OH. Harry resided in 1920 in Glander Rd, Lanier Twp, Preble Co, OH. He worked as Farm Laborer - Home Farm in 1920. He resided in 1930 in Moses Rd, Lanier Twp, Preble Co, OH. He resided in Apr 1930 in Lanier Twp, Preble Co, OH. He worked as Farmer in Apr 1930. Harry married 1 Pearl Louise CRAIG [scrapbook] 2, 3, daughter of Francis Marion CRAIG and Katie Irene JONES, on 19 Apr 1930 in Preble Co, OH. Pearl was born on 17 Jun 1906 in Preble Co, OH. She died on 22 Nov 2000 in Governor Harris Homestead. She was buried on 27 Nov 2000 in Twin Valley Cemetery, West Alexandria, Preble Co, OH. Pearl resided in 1930 in Moses Rd, Lanier Twp, Preble Co, OH. She resided in Apr 1930 in Eaton, Preble Co, OH. She worked as Seamstress in Apr 1930. She was a member of St John's Lutheran Church - Member in Ingomar, Preble Co, OH. She was issued a social security number before 1951 in OH. + 8573 F i Lois SPITLER. 4293. Carl Sherman SPITLER 1, 2, 3 (Daniel Franklin SPITLER , Sarah Margaret BERNHEISEL , Abigail MAURER , Sarah BITLER , John , Johannes ) was born on 19 Feb 1908 in Lanier Twp, Preble Co, OH. He died on 13 Sep 1994 in West Alexandria, Preble Co, OH. He was buried on 16 Sep 1994 in Fairview Cemetery, West Alexandria, Preble Co, OH. Carl resided in 1920 in Glander Rd, Lanier Twp, Preble Co, OH. He resided in 1930 in Moses Rd, Lanier Twp, Preble Co, OH. He resided in 1969 in West Alexandria, Preble Co, OH. He was a member of St John's Lutheran Church - Member in Ingomar, Preble Co, OH. He worked as Frigidaire Corp. He resided in Sep 1994 in 58 Hope Ave, West Alexandria, Preble Co, OH. Carl married Mildred EBY 1, 2, daughter of Amos EBY and Zella HOOK, on 10 Aug 1933 in Preble Co, OH. Mildred was born on 12 Jun 1915 in Gratis, Preble Co, OH. She died on 31 Mar 2003 in Lakeland, Polk Co, FL. She was buried in Fairview Cemetery, West Alexandria, Preble Co, OH. Mildred resided in Sep 1994 in West Alexandria, Preble Co, OH. She resided in West Alexandria, Preble Co, OH. She resided in Mar 2003 in Lakeland, Polk Co, FL. 8574 M i Larry A SPITLER. Larry married Beverly A MILLER. 8575 M ii Richard E SPITLER. 4294. 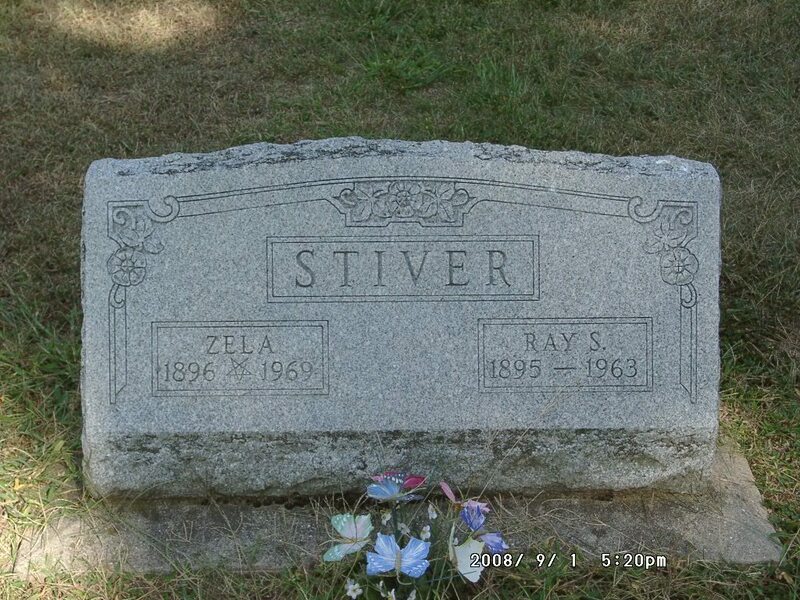 Ray Sylvester STIVER [scrapbook] 1 (Abbie Esther SPITLER , Sarah Margaret BERNHEISEL , Abigail MAURER , Sarah BITLER , John , Johannes ) was born on 9 Jul 1895 in OH. He died on 4 Mar 1963 in Grandview Hospital, Dayton, Montgomery Co, OH. He was buried in Twin Valley Cemetery, West Alexandria, Preble Co, OH. Ray resided in 1910 in Jackson Twp, Montgomery Co, OH. He resided in Jun 1917 in Farmersville, Montgomery Co, OH. He worked as Mechanic in Jun 1917. He resided in 1920 in 48 South St, West Alexandria, Preble Co, OH. He worked as proprietor - garage in 1920. He resided in 1930 in Jackson Twp, Montgomery Co, OH. He resided in 1946 in Farmersville, Montgomery Co, OH. He was issued a social security number in 1955/1956 in OH. He resided in Mar 1963 in Montgomery Co, OH. Ray married Zella IZOR [scrapbook], daughter of Samuel IZOR and Catherine Elizabeth STIVER "Kate". Zella was born on 1 Dec 1896. She died on 10 Feb 1969 in Grandview Hospital, Dayton, Montgomery Co, OH. She was buried in Twin Valley Cemetery, West Alexandria, Preble Co, OH. Zella resided in 1910 in Jackson Twp, Montgomery Co, OH. She resided in 1920 in 48 South St, West Alexandria, Preble Co, OH. She resided in 1930 in Jackson Twp, Montgomery Co, OH. She was issued a social security number before 1951 in OH. + 8576 F i Catherine STIVER. + 8577 F ii Martha Jane STIVER was born on 4 Sep 1920. She died on 22 Nov 1988. 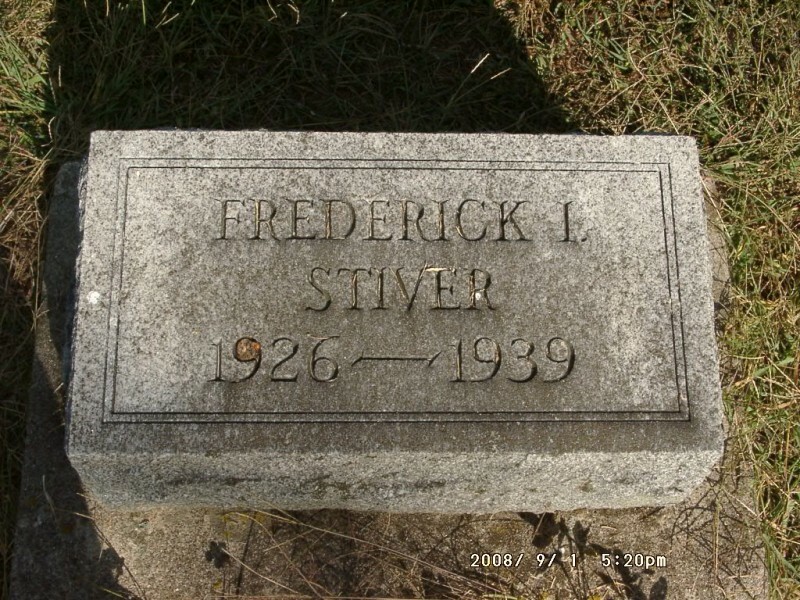 Frederick I STIVER [scrapbook] was born on 29 Sep 1926 in Farmersville, Montgomery Co, OH. He died on 26 Apr 1939 in Dayton, Montgomery Co, OH. He was buried in Twin Valley Cemetery, West Alexandria, Preble Co, OH. Frederick resided in 1930 in Jackson Twp, Montgomery Co, OH. 4295. Carrie May STIVER 1, 2 (Abbie Esther SPITLER , Sarah Margaret BERNHEISEL , Abigail MAURER , Sarah BITLER , John , Johannes ) was born on 29 May 1897 in OH. She died on 19 Jan 1990 in Lebanon, Warren Co, OH. She was buried in Germantown Cemetery, Germantown, Montgomery Co, OH. Carrie resided in 1910 in Jackson Twp, Montgomery Co, OH. She resided in 1920 in Jackson Township Rd, German Twp, Montgomery Co, OH. She resided in 1930 in Clark Rd, German Twp, Montgomery Co, OH. She resided in 1942 in Brown's Run Rd, Germantown, Montgomery Co, OH. She resided in 1946 in Germantown, Montgomery Co, OH. She resided in 1974 in Germantown, OH. Carrie married Homer Herbert CLARK [scrapbook] 1, 2, son of David CLARK and Lucy V, about 1915. Homer was born on 1 Dec 1893/1894 in German Twp, Montgomery Co, OH. He died on 19 Nov 1972 in Kettering Medical Center, Dayton, Montgomery Co, OH. He was buried in Germantown Cemetery, Germantown, Montgomery Co, OH. Homer resided in 1910 in State Rd 9, German Twp, Montgomery Co, OH. 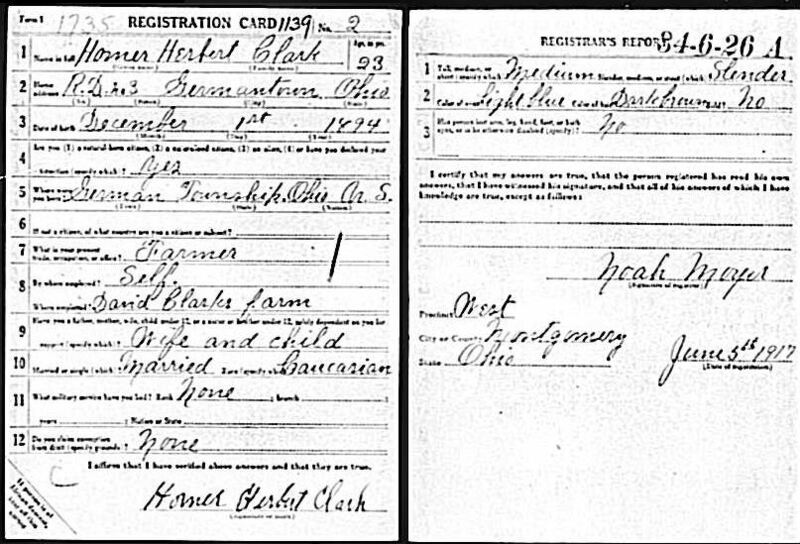 He resided in Jun 1917 in RD 3 Germantown, Montgomery Co, OH. He worked as farmer (on David Clark farm) in Jun 1917. He resided in 1920 in Jackson Township Rd, German Twp, Montgomery Co, OH. He worked as farmer - farm in 1920. He resided in 1930 in Clark Rd, German Twp, Montgomery Co, OH. He worked as farmer - general farm in 1930. He resided in 1942 in Brown's Run Rd, Germantown, Montgomery Co, OH. He worked as farmer in 1942. Herbert Emerson CLARK was born on 2 Mar 1916 in Germantown, Montgomery Co, OH. He died on 30 Jan 1925 in German Twp, Montgomery Co, OH. He was buried in Germantown Cemetery, Germantown, Montgomery Co, OH. Herbert resided in 1920 in Jackson Township Rd, German Twp, Montgomery Co, OH. + 8580 F ii Georgia Mae CLARK was born on 24 Oct 1921. She died on 14 Jun 1991. + 8581 M iii Homer D CLARK.